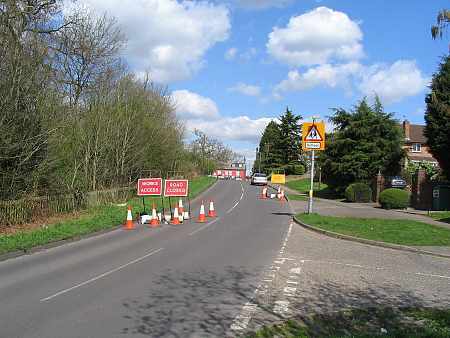 As at 1st June 2005 the A414 is open between the Bell public house and the A12. There are no road markings & there is some tidying up work to be done, but the new road surface is down. Trouble is that the next Phase has started, the A414 is now partially closed between Eves Corner & the Oak Corner towards Maldon. Click Here for A414 rerouting while the road is actually dug-up. Thanks to Murray Niman for the digital information format. It is in PDF Format & is nearly 200KB. It may say it is Active X, but it is not!. Detail of the buses from Chelmsford to Danbury which shows that they use Woodhill Road and then go into Well Lane to the Bell public house. From this, one can deduce that the road is being dug up between by the Management College up to the Bell public house. This does support the theory that it is solely Road Drains - ECC have not actually stated. Monday dawned bright & clear to reveal road signs all around Danbury declaring "Road Closed". Many people simply could/would not believe that their favourite "rat run" through Danbury was CLOSED. Some even drove all around Maldon & Rettendon to "see for themselves". McAlpines had sub contracted the closure of the A414 to Anglia Traffic Management who have country wide experience in this sort of thing. Danbury was basically a ghost village today. 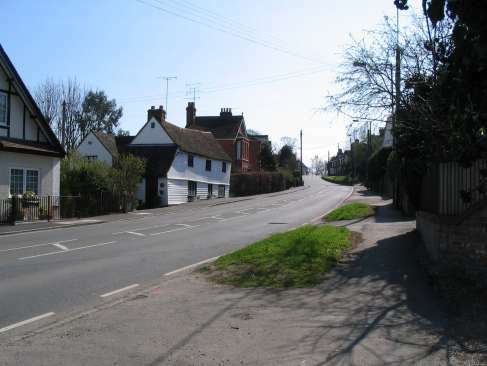 Looking up the A414 towards the Griffin public house - no cars or lorries. A picture virtually impossible to take normally. Please note that the Griffin is "open" and cars can get there without a problem. A414 looking towards the Bell public house. Looking towards the Bell public house and down the A414 towards Chelmsford. 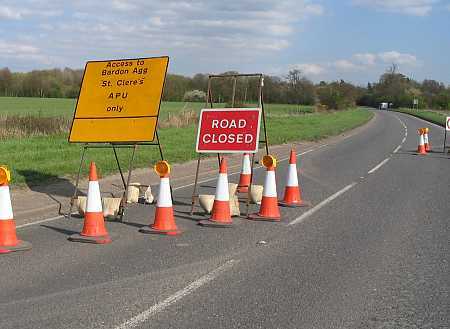 Anglia Traffic Management Staff is manning the road block. 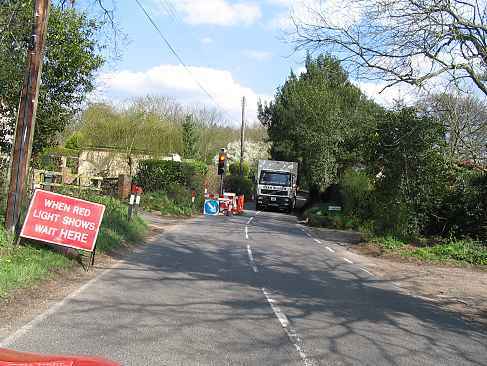 Many small lorries felt that they could get past the new hole dug in the road and get some gravel from St Cleres Pit. 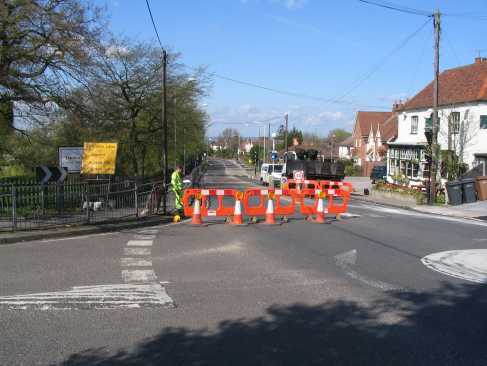 They have to use Woodhill Road provided that they are under 7.5 Tonnes, otherwise it is a detour to Rettendon Turnpike and then along the A130-A12 and the bottom of the A414 to the Pit. Looking up Well Lane towards the Bell public house. The Bell is also "open" & pleased to serve you. The Woodford Clinic is also "open" as usual. It is simply that one could not turn left & travel down the A414 towards Chelmsford, past the Management Centre. Rose Cottage Corner with Traffic Lights. 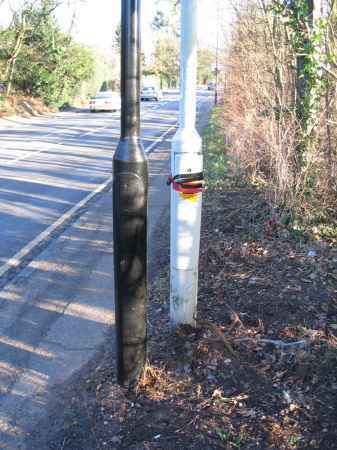 These are very neccessary as they will prevent a very serious accident when a public bus meets "white van man" on the corner. Note the size of the lorry and its position on the road - there simply is not room for large artics to use Woodhill Road. looking towards Danbury by Hulls Lane. 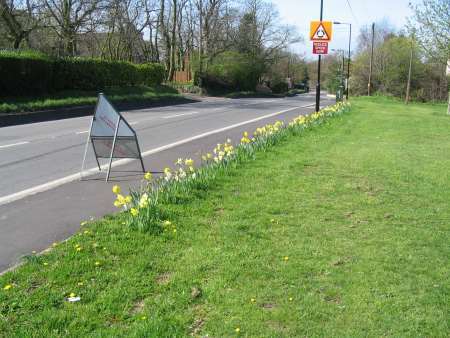 In November, 2004 the Borough Council dropped the bombshell that they were to spend £2.7million on a grand spruce-up of the A414 through Danbury. This was a shock as for years CBC & Essex County Council had said that there was no money available to do the works which the Parish Council, The Danbury Society & individuals had requested. The reality is that with something like 26,000 vehicles per day on the road it had deteriorated to a stage whereby many of the roadside pavements were below the road level - not a safe situation for walkers. The first most people knew about the scheme was a chalked notice outside the Flower Shop saying "This road will be shut for 3 months". After a long time a Press Report was issued which clarified what was planned. You need Abobe Reader to see the document below. Page 1 & 2 is the letter, page 3 is the Schematic Schedule of the 3 Phases. Click on the "<--BACK Button" on the top left of your Browser to get back to this page. 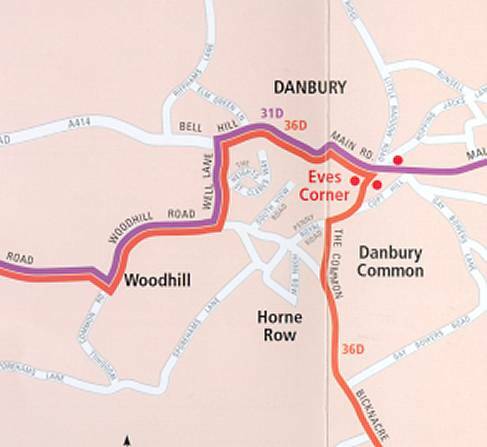 Click Here for Danbury A414 Roadworks Information issued as a letter in November by ECC. Essex County Council (ECC) have scotched a number of rumours as to the reason(s) behind the scheme. 1. It was not to service the proposed 240 odd new houses near Runsell Green where Berkely Homes have an Option to build. 2. It was not to prove better transport links to Maldon & the Dengie (which it will) AND to remove the need for an upgrade in the A1018/9 between Maldon & Hatfield Perveril. 3. It was not to service 600 new houses to the East of Danbury - details still Secret!. It was, plain & simple - a Maintenance job - the biggest ECC had undertaken. As it was seen by ECC as a Maintence Scheme & not a new capital works project, ECC felt that they simply had to "inform Danbury what was going to happen, NOT Consult". A big mistake!. An exhibition of the works due to begin on the A414 in Danbury this year will take place on Friday 28 and Saturday 29 January at the Sports and Social Club, Danbury. The extensive maintenance scheme is now well underway and is moving towards a road closure, which is programmed to start on 11 April for at least 12 weeks. The County Council has no other option but to introduce lengthy diversions until this essential work is completed. During the closure, most of the road will be resurfaced, using low-noise material, and highways drains, which are in a poor state, will be replaced. The opportunity will be taken to repair footways at the same time. Phase 1 of the £2.7 million scheme began last year, with resurfacing footways, new bus stops and replacement street lighting. Visitors to the exhibition will be able to view the diversion routes and speak to Highways Engineers about the work, which is likely to cause severe disruption to traffic. 'The A414 is a primary east-west route, carrying around 22,000 vehicles a day and so we appreciate the concerns of drivers, residents and local businesses who will face delays and disruption', commented Councillor Rodney Bass (Con. Tollesbury), Cabinet Member for Highways and Transportation. 'The work is vital for safety reasons. We hope people will visit the exhibition to have their questions answered and be reassured that we are doing all we can to keep problems down to a minimum. For example, we will be working extended hours from 7.00am to 9.00pm, but because the road is so near to houses, we will not be working 24 hours, or after 9.00pm or on Sundays. The exhibition will be open on Friday from 9.00am to 7.00pm and Saturday from 9.00am to 5.00pm. Information on local bus services affected by the road closure in Danbury will be published shortly. Copies of this information will be distributed along the affected routes and will also be available from Essex County Council by contacting the Traffic Control Centre on 0845 6000110. End of Press Release by Media contact: Hazel Smith, on (01245) 430094. Phase 1 is the replacement of all of the street lights on the A414 from the edge of the Village near Runsell Green (Maldon side) to Riffhams Lane (Chelmsford side). This was scheduled to be completed by Christmas 2004 but is running a little late. It looks more like the end of January 2005. C) does not project so much light into the sky. As part of Danbury is a Conservation Area the Lighting Standards have to be painted black - ECC have been very good & specified all to be black. The Lighting Contractor has evened out the lights more, not simply replaced "one for one". Picture of the new black Lighting Standard opposite the Flower Shop in Danbury. To go back to the U3A Home Page, click the BACK Button on your Browser (quicker) or click below. Last revised 11th April, 2005 to provide the pictures of the road closure.